This week’s VerseDay guest Blogger is Lesléa Newman. 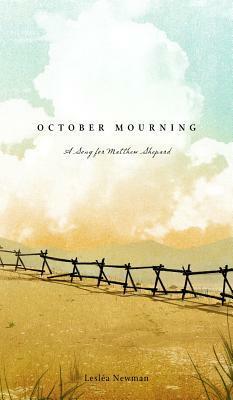 Lesléa’s verse novel, OCTOBER MOURNING: A Song for Matthew Shepard contains a cycle of sixty eight poems telling the story of Matthew’s murder and the impact of this terrible tragedy on his community and the world. Lesléa uses many poetic techniques and forms in her book. In her guest post she discusses one of them: personification. Personification is a poetic technique that gives voice to the voiceless such as an inanimate object. Personification gives the poet an opportunity to use his or her imagination to bring something to life. The poet, and by extension, the reader, relates to the object in a new way, which often brings up strong emotions. The poet, by fence where Matthew Shepard was left to die. In my historical verse novel, OCTOBER MOURNING: A SONG FOR MATTHEW SHEPARD, I use the method of personification many times. The novel explores the impact of Matthew Shepard’s murder upon the world. In 1998, Matthew Shepard was a gay college student attending the University of Wyoming when he was kidnapped, robbed, beaten, tied to a fence, and left to die. It was the start of Gay Awareness Week, and Matthew Shepard was murdered because he was gay. In addition to being a personification poem, “The Fence (that night)” is a pantoum. Each stanza consists of four lines. The second and fourth line of the first stanza become the first and third line of the second stanza and this pattern is repeated throughout the poem. The last stanza picks up the first and third line of the first stanza so that every line in the poem is used twice. (It isn’t as difficult as it sounds; the best way to write a pantoum is to have one beside you to use as a pattern). I find when writing about something that contains intense emotion, it is helpful to have a form or container, that can hold this strong emotion. Concentrating on rhythm, repetition, line length and meter gives me distance from the raw material. At the same time, as I keep circling back to the event, I go deeper and become closer to it. This creates tension in the poem: the reader quickly comes to expect repetition but doesn’t know exactly how the repetition will occur. And this tension heightens the emotional experience of the poem. I find that the use of personification, especially within formal poetry is an excellent way to engage the reader, especially when writing about intensely emotional material. I loved October Mourning! I just happened to find it at my library when I was researching verse novels and I am so happy I did!